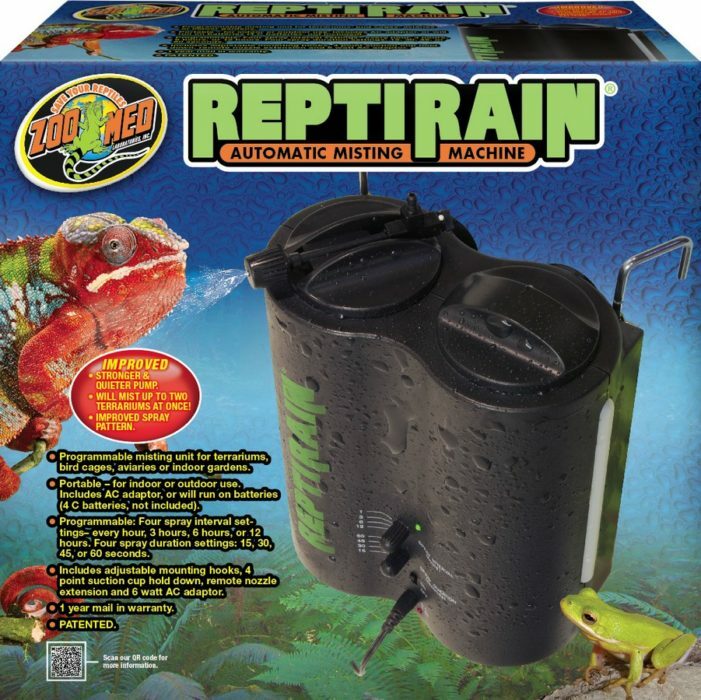 Repti Rain® Automatic Misting Machine | Zoo Med Laboratories, Inc. Programmable misting unit for terrariums, bird cages, aviaries or indoor gardens. New technology allows for a stronger and quieter pump that can mist 2 separate cages. Portable: for indoor or out-door use. Includes AC adapter, or will run on batteries (4 C batteries, not included). Four programmable spray interval settings 1/2 every hour, 3 hours, 6 hours, or 12 hours. Four spray duration settings: 15, 30, 45, or 60 seconds. Includes adjustable mounting hooks, 4 point suction cup hold down, remote nozzle extension and 6 watt AC adapter. Formerly known as the Habba Mist®. Zoo Med’s Repti Rain® is a misting machine that works great for a variety of tropical pets. Here’s Ashley to show you how it works. Q: How much water does the Repti Rain® hold? A: The reservoir holds 28 oz of water. Q: The unit did not include the Remote Sprayer Hose (PART C) and the instructions say it is included? A: The Remote Sprayer Hoses (PART C) are part of the Duel Remote Sprayer Splitter (Part B). There are 2 in total. Remove from the Splitter to use individually.